Say “Yes” to the Mountain! Don’t just say “yes” to the dress! Imagine saying vows to your loved one high atop the Allegheny Mountains on the beautiful lawn surrounded by forest. 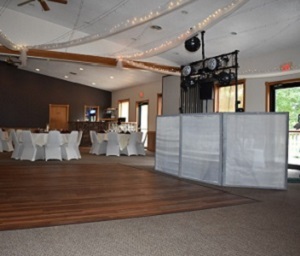 You can make your dream of a beautiful outdoor wedding-come-true at Blue Knob All Seasons Resort in, Claysburg, PA.
Blue Knob All Seasons Resort has an outdoor gazebo and a lovely grassy lawn for chairs, framed by a golf course backdrop. We can accommodate your heart’s desire for an outdoor wedding, and after the ceremony, you and your guests can retire to our patio for hors d’oeuvres and drinks. To learn more, contact our event specialist at 814-239-1035. If your wedding dream is something more formal, our wedding and event specialist can make your dream day as formal or even as casual as you would like. 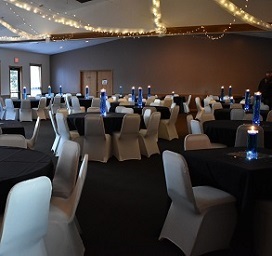 We offer a beautiful banquet facility and made-to-order food service. Our full-service all-inclusive packages are custom designed just for you! With crisp mountain air and beautiful alpine skies, your wedding day will be unforgettable at Blue Knob All Seasons Resort. We can also help you plan and execute a lovely no-hassle rehearsal dinner or a brunch for guests the day after the wedding. 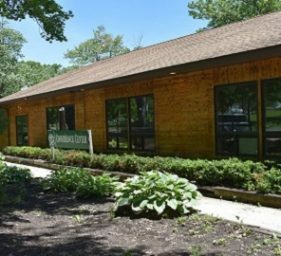 We also offer accommodations so your guests can stay-and-play!